Web-based back office staffing software that minimizes human error and boosts efficiency. Your back office solution should facilitate speed, accuracy, and efficiency when processing billing and payroll. Adapt’s web-based back office staffing software maximizes productivity and accuracy while eliminating third-party payments for cost savings. Adapt updates records in real-time when data is entered for payroll or billing with workflows in place to prevent human error. Adapt’s financial workflows provide checks and balances for full compliance, with the option for versatile batch types for easy management of processes. Placed employees can securely access a web portal to view pay stubs, W2s and check history, while staffing clients have the ability to view their invoice history and current balance, alleviating you of time-consuming query handling. Set-up and define fee types, such as relating to the Affordable Care Act, at the corporate, client, job order, or assignment level. Whether you’re entering one record, time cards or importing data from clock systems, the process is simple. 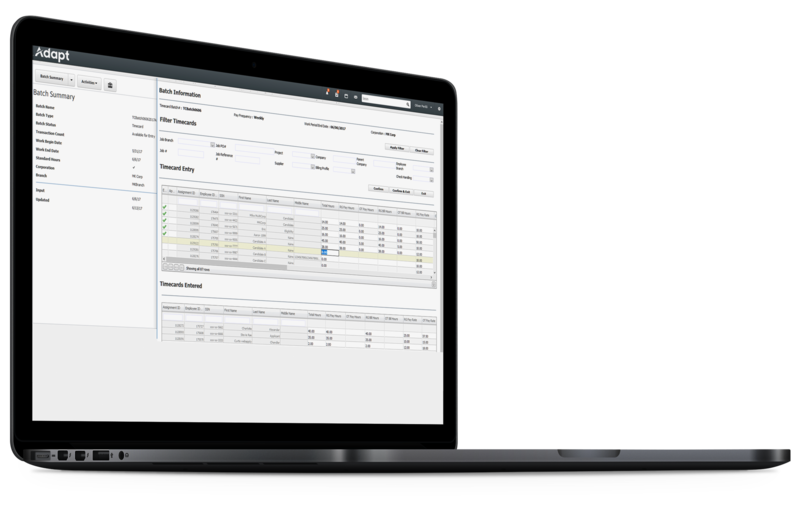 Unlike other applicant tracking systems, Adapt unifies front and back office software solutions in one so that payroll, billing, and reporting are completed more quickly and accurately. Minimize human error and boost efficiency.